From time to time, for reasons I don't really understand, the UK Athletics Department decides to tinker with its logos. 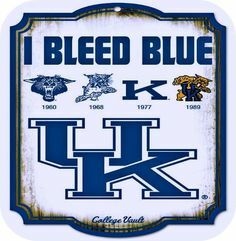 To me, UK's best logos can be seen here and here (check out the leaping Wildcat). But they like to make changes. Here is the new logo collection. As you can imagine, the folks on the Kentucky message board were not impressed. I totally agree with you and Mrs. Tyler Thompson about the "Power K," and I agree that the new Wildcat looks like Kansas State.